Update April 12: congratulations to Bielefeld Academic Search Engine (BASE) - and all of the contributing repositories - now over 90 million documents. On the Global Open Access List, BASE's Dirk Pieper estimates that 60% of the content is open access. 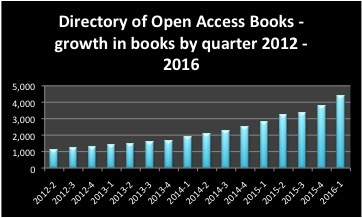 There are now 150 publishers of peer-reviewed open access books listed in the Directory of Open Access Books, publishing more than 4,400 open access books. 620 books were published in this quarter alone, a 16% increase in just this quarter. 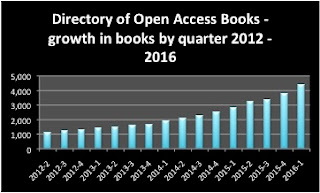 The Directory of Open Access Journals has been adding titles at a net rate of 6 titles per day, 540 journals added this quarter for a total of over 11,000 journals. This is the highest DOAJ growth rate since this series started! Bielefeld Academic Search Engine repositories collectively added more than 4.7 million documents this quarter for a total of just under 89 million documents. SCOAP3 nearly doubled in size this past year (87% annual growth) for a total of 4,690 documents. arXiv grew by over 107,000 documents to over 1.1 million documents during the same time frame. Internet Archive is likely to be featured in the next issue as it is currently edging towards a milestone of 10 million free texts. The number of journals actively participating in PubMedCentral, making all content immediately freely accessible, and making all content open access, continues to grow. Meanwhile at PubMed a transition in indexing practice (from manual to automatic) means that a search for NIH-funded articles in the last 90 days significantly underreports results (1,402 NIH funded articles in the past 90 days compared with a range of 7,846 - 19,790 with a 90-day search limit for NIH funded article since 2008). Without the indexing, it is not possible to determine the percentage of full text. Here's hoping the automated indexing process results in a catch-up soon; it doesn't matter very much if the statistics for this series fall a bit behind, but people rely on this indexing to search for medical information. The Electronic Journals Library added 3,612 journals that can be read free-of-charge in the past year, for a total of 52,000 journals, a 7% growth rate. 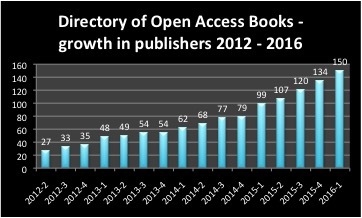 This post is part of the Dramatic Growth of Open Access series. Open data can be downloaded from the Dramatic Growth of Open Access dataverse.